LAKE CHATUGE Access Home With Use of a PONTOON BOAT- Book 2019 Now!! LOCATION- North Side of Lake Chatuge, Hayesville, NC. LAKE CHATUGE ACCESS WITH USE OF A PONTOON BOAT! Not Lakefront but Lake View from Porch and yard. THE PATTERSON HOUSE, located on Elf Point is your opportunity to book a vacation in a pet friendly Lake Access home on a quiet point with a nice lake view and access to a community boat slip that comes with the use of a Pontoon Boat for your lake enjoyment! The Pontoon Boat is yours for full usage during your stay and it is docked about 300 Yards from the house. This well landscaped, well furnished, home is located on Elf Point on the North Carolina side of Lake Chatuge. This is an older home with native rock veneer outside but has been totally renovated on the inside. Guests have commented that the pictures do not do the house justice, especially the inside, so we have added some new pics. It has two master bedroom suites and one other large bedroom. One master bedroom has a rock fireplace with gas logs, a king bed and a bath with a large jetted garden tub/shower. The other master bedroom has a king bed, sitting area and large bath with a jetted garden tub/shower. The third bedroom has two double beds and a large bath with jetted garden tub. All bedrooms have TVs. The kitchen has all appliances with a washer and dryer. The kitchen has a lake view. The den has a single pull-out sofa and TV. The living room has a queen pull-out sofa, Large Screen TV and also has an adjacent large bath with jetted tub/shower. There is a screened porch, with some lake view, located off the living room. The porch has a sitting group as well as a glass table with 6 dining chairs. There is a gas grill and an outdoor fireplace adjacent to the porch. The home is nicely furnished with crown molding and many extras on the inside. Access to a private community boat dock slip is nearby and use of A PONTOON BOAT is included in the rental. Elf Point is a quiet community that is great for biking, walking or running, with a large wooded TVA forest on the end of the point. The full rental fee is due 10 days prior to arrival. Cleaning and pet fees are also due 10 days prior to arrival. The Pontoon boat will be full of fuel and oil but subsequent fill-ups are the responsibility of the user and the Pontoon must be left full of gas and oil. 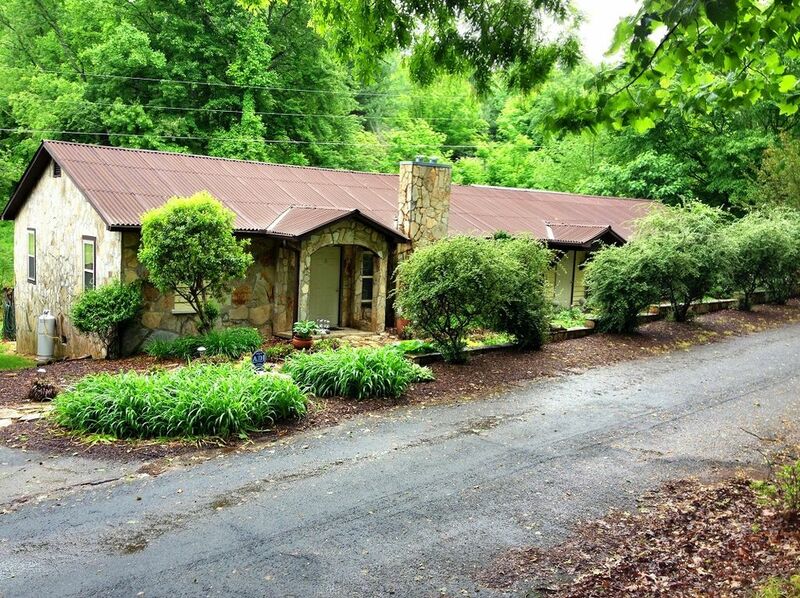 Keywords: House, pontoon, boat, view, lake, Chatuge, Hiawassee, Young Harris, Lake Access, Lake View, Boat Slip. We live in Helen, Georgia about 40 minutes from the Patterson House. We stress great customer service and want our travelers to have a very enjoyable time. It is unique and located in a great neighborhood. Please check-out our reviews. Lake access comes with Optional Pontoon Boat use for your Lake enjoyment. Comfortable and clean. Nice landscapind and yard. Nice screened porch with lake view. Quiet neighborhood. Great place to bike or walk. Pet friendly. All on one level. 4 Baths. Lake Access with Lakefront View. Access is the boat slip at a private community dock 300-400 yards from the house. A pleasant walk or there is ample parking at the dock. House is about 200 feet from the lake with good lake view but we do not own all the lawn area between the house and the lake. Code is located on the router. Fully stocked with coffee maker, pot, pans and linens. Table in Kitchen seats 6 and table on the screened porch seats 8. Lake access to private, community boat dock with optional Pontoon Boat rental. We charge $500 for the Pontoon Boat rental for 3,4,5,6 or 7 days. The rental period for the Pontoon must be the same as the rental period for the House. Marinas on lake charge about $200 per 4 hours for pontoon rental or $300 per day and $1,400 weekly. This was a beautiful property. Extremely clean with a lot of amenities that made it feel like home. Cliff was great. He was there to meet us upon arrival and made sure we were happy, comfortable and knowledgeable about the the house and the boat before leaving. The lake was so relaxing with majestic views. It was only a short walk to the boat that was quite enjoyable to stretch our legs. The house had a large yard with a real brick fireplace/grill, screened in porch plus a patio with a new gas grill, ping pong table, dart board and patio chairs. The interior furniture wasn't new but high quality and beautifully decorated. Such a beautiful place. Thank you for letting us enjoy your property. Thank you so much for the review. It was a pleasure meeting you and your family and we are pleased that you enjoyed your visit to the Chatuge Area! The house was roomy, however, it is an old house and smelled musty. Cabinet drawers especially smelly. Needs a good cleaning. There were no extra towels or linen. Mattresses and couch need replacing. We were very disappointed that the property does not have a dock or lake access. Feel misled by photos and description on vrbo. We were very happy with screened in porch. Thank you for the review. Sorry that you were disappointed. The house was cleaned before your arrival. I checked it prior to your arrival and found that it was in great condition. Also checked the four baths and all had two full sets of towels in each. That makes 24 towels, hand towels and cloths. Not sure what you mean by extra? The website clearly states that lake access is available with the pontoon boat. You did not opt for the boat. Sounds like you may want to consider a lakefront next time. Thanks again for staying with us. You would have the same lake access if you stayed in Atlanta. I spoke to the owner and asked about lake access when I arrived. He said there was none available to us. We could use any of the public parks around the lake. Difficult to explain to two young children that even though we could see the lake we could not use it unless we loaded up in the car and drove to a park. The house itself was fine if a bit dark. The mildew on the ceiling of the bathroom did not improve the ambiance. Overall I feel the house was overpriced and the lake access is blatant false advertising. I am sorry this guest was not pleased with the Lake availability but his claim of false advertising is very unfair. It is clearly stated on the Website that the lake access is through use of the Pontoon Boat. This guest did not opt for the Pontoon Boat use option. As for the house being overpriced- he paid approximately $300 per night for a nice private home with three bedroom suites with private baths as well as an extra full bath. The Guest also brought two pets and several guests. A hotel stay for this group and the pets would have cost much more! Lovely setting and family fun! Thank you for allowing my family to stay in your wonderful home! We really enjoy the space and screened in porch! Bedrooms are spacious with private baths in each. Stocked kitchen and room to spread out. We enjoyed using the pontoon boat each day and being on Lake Chatuge. We went paddle boarding and fishing as well as visit the local restaurants. We will definitely be back. Thank you so much for the kind review! Please consider us again in the future. It was a nice home, but it could use comfortable furniture and being a handicapped person, the home needs more support such as a better walkway and better ways to use the tubs. We also would have enjoyed more lake access! Thank you to the guest for saying that it is a "nice home". This was an unusual rental. The booking was made and rental agreement was executed in one name but the reservation and this Review is listed in another name. I called the original guest to inquire about this as well as an issue with their check-out. The original guest said that he does no know the other person. And he did not say anything about the furniture being uncomfortable or the walkway concerns expressed in this Review. So I am not sure what is going on here but will contact the original guest again to see if he did indeed originate this Review. My family and I chose this house because of the bedrooms/bathrooms configuration. Traveling with my husband, 3 kids, sister, mother and grandmother, it’s always difficult finding a home that’s both cozy but spacious but this house gave us all the space we needed but comfort we wanted. The home has a wonderful kitchen and although the dining room set up is a bit difficult with as many people as we had we made it work and enjoyed our meals as a family! My kids made sure to take full advantage of the ping pong table and we even bbq’d in 30* weather! The best part of this house however, is the back deck. Just sitting out back on the comfy seats listening to leaves rustling and wind blowing is the best therapy for a frazzled mind! I only wished we could’ve stayed longer! Mr. Cliff was awesome, very attentive and eager to help. He showed up the day we arrived with a Christmas tree and a wreath since we would be spending Christmas in the home! We also took our 17 lb wiener dog and he loved going for walks around elf school and the lake. Relatively close to grocery stores, restaurants and gas stations. Just an all around great house that’s suitable for large families looking for a retreat from the manic every day life! We will definitely be coming back! Thank you Mr. Cliff for all your hospitality! Thank you so much for the kind review! It was a pleasure to meet you and your family and we are so happy that your Christmas and Holiday in the Mountains was all you hoped it would be. Thank you also for making the point, for our future guests, that mountain lakes can also provide a great Winter experience!! Located near Hiawassee and Young Harris Georgia, GA and Hayesville, N.C. Lake Chatuge straddles the Ga and NC border. Great mountain vistas, National Forest and TVA undeveloped spaces on the NC side of the Lake. Plentiful recreation, hiking, waterfalls, Appalachian Trail, Trout fishing, lake fishing, boating, dining and entertainment opportunities on both sides of the Lake. The first payment of 25% is due at booking and the final 75% is due 10 days prior to arrival. Full refund for cancellation up to 90 days prior to arrival. No refund for cancellation within 90 days of arrival. The Pontoon Boat usage, for your full stay, is included with the home rental.